Browsing through Cuttyantiques.com can be a voyage through maritime history or simply a casual search for things related to the sea. Take your time to enjoy some of the finest nautical items available. 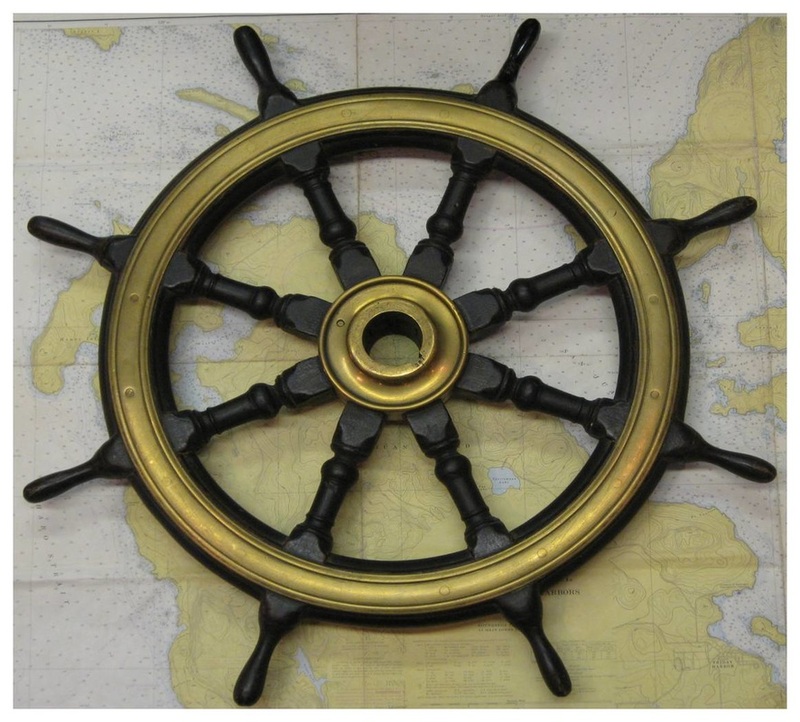 Our inventory includes antique navigational instruments and ship's lanterns, clocks, wheels, telegraphs, binnacles, telescopes, ship models, both vintage and new and many other nautical decorative items. Please take a look through our vast collection and let us know if you have questions regarding any of the items we have. Cuttysark Nautical Antiques is a family owned and run business. A father and daughter team made up of Roger, who has been a life long collector and now 13 year store owner and his daughter Jenn who has been with the store for 9 years now and helps run the day to day business here online. ​Launched in June of 1977 as CUTTYSARK OF BELLEVUE, our store was originally anchored on Main Street in Old Town Bellevue, Washington. In May of 2004, CUTTYSARK raised anchor and set sail for Pioneer Square, on the southwest edge of downtown Seattle. No longer in Bellevue, our name board was changed to CUTTYSARK NAUTICAL ANTIQUES. During the last 39 years, thousands of fine marine antiques have been found, bought, restored and sold to avid collectors, boat owners and folks who just want the feel of the sea in their home or office. Small fact, after this many years in business we have actually seen some of the same items we sold 30+ years ago and helped them find new homes. Our store also specializes in a small selection of high quality, new, nautical items including lighting, clocks, ship models, lighthouse models, flags of the world and a wide range of collectibles. In addition, we proudly present prints and paintings by the leading maritime artists. One of the few specialty stores of our kind in the country, our goal is to provide our customers with a great selection of rare and unique nautical items. We will not sell, share or trade your private information with anyone. We might, from time to time, send you an e-mail newsletter using your e-mail address. If you do not wish to receive newsletters, contact us and we will gladly remove you from the list. APPRAISALS OR INQUIRIES: While we are more than happy to answer questions concerning items on cuttyantiques.com, we are unable to provide individual appraisals over phone or email. We will travel to locations in the Seattle area to provide appraisals for a fee. Please contact us to make an appointment and we will be happy to discuss your nautical collection. We can not provide additional information on items we can not see in person unfortunately. For example, items you may have found or have in your collection. Because we are a small shop, items will be packed and shipped the next business day after your purchase. If a purchase is made on Friday it will be sent out Monday. Shipping costs is included in the purchase cost of each item. Those cover shipping to the lower 48 U.S. states. In the case of shipping to Alaska, Hawaii or another country we will need to run an additional cost and that amount will be invoiced to you via email after the purchase is made. Please contact us with any specific questions. All items will be shipped UPS Ground and take five to seven days to arrive and all items are insured for their actual cost. In the case of large or very fragile items, we will discuss special commercial packing/crating and shipping charges. If you need an item faster please contact us and we can make special arrangements or if you are in the Seattle area we can schedule local pick ups and will deduct the shipping cost. RETURNS: On antique items, we will make every effort to fully inform you about the item and provide e-mail photos if requested. All of our antiques are sold "as is" and are non-returnable. In the case of something being damaged in shipping please keep all original packing and contact us immediately with photos.